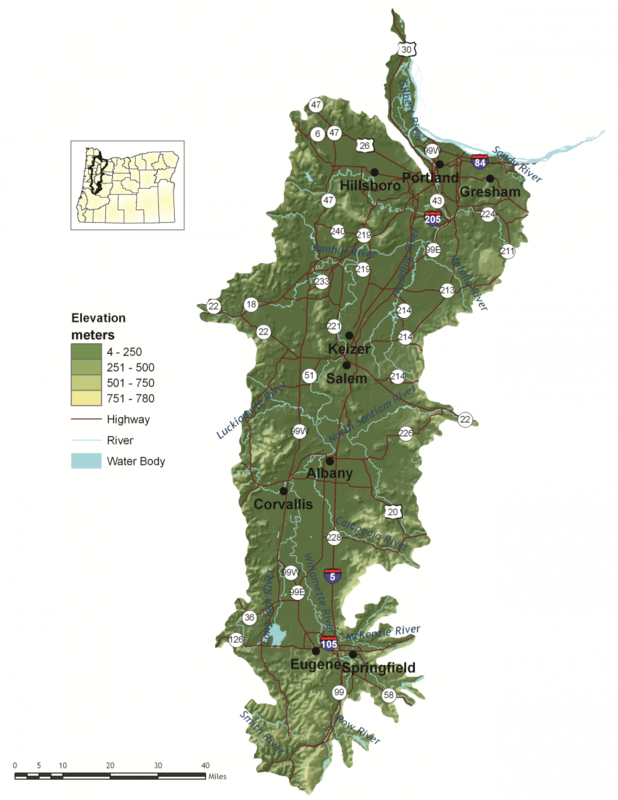 Bounded on the west by the Coast Range and on the east by the Cascade Range, this ecoregion encompasses 5,308 square miles and includes the Willamette Valley and adjacent foothills. Twenty to 40 miles wide and 120 miles long, the Willamette Valley is a long, level alluvial plain with scattered groups of low basalt hills. Elevations on the valley floor are about 400 feet at the southern end near Eugene, dropping gently to near sea-level in Portland. The climate is characterized by mild, wet winters and warm, dry summers. Fertile soil and abundant rainfall make the valley the most important agricultural region in the state. Culturally, the Willamette Valley is a land of contrasts. Bustling urban areas are nestled within productive farmland. Traditional industries and high technology contribute to the vibrant economy. With Interstate 5 running its length, the Willamette Valley’s economy is shaped by the transportation system and the flow of goods. With 9 of the 10 largest cities in Oregon, the Willamette Valley is the most urban ecoregion in Oregon. It is also the fastest-growing ecoregion. Pressure on valley ecosystems from population growth, land use conversion, and pollution is likely to increase. The Willamette Valley ecoregion is both the fastest-growing ecoregion in Oregon and the most densely-populated, containing the state’s three largest urban centers, Portland, Salem, and Eugene. The population projected for 2050 is approximately four million, nearly double today’s population. The ecoregion also provides about half of the state’s agricultural sales. It includes 6 of the top 10 agricultural-producing counties, and 16 of the top 17 private sector employers (e.g., manufacturing, high technology, forest products, agriculture, and services). Historical accounts indicate that prior to European settlement, much of the Willamette Valley was covered by native grasses, forbs, and oak savanna. The Calapooia people regularly set fires to improve hunting and travel. The fires helped to maintain the valley’s mosaic of grasslands, oak savannas, wet prairies, and other open habitats. Since the 1850s, much of the Willamette Valley ecoregion has been altered by development (agricultural and urban), particularly affecting oak woodland, oak savanna, grassland, riverine, and wetland habitats. The Willamette River has been disconnected from its floodplain, and much of the historical habitat has been fragmented. About 96 percent of the Willamette Valley ecoregion is privately-owned, presenting challenges to conservation efforts. Conservation strategies that focus on needs of individual at-risk species and key sites are particularly critical in this ecoregion. Key Conservation Issues of particular concern in the Willamette Valley ecoregion include Land Use Changes, Disruption of Disturbance Regimes (both fire and floodplain function), Challenges and Opportunities for Private Landowners to Engage in Conservation, and Invasive Species. In addition to the statewide factors, specific hazards to wildlife in urban areas and habitat fragmentation are of conservation concern here. Habitat continues to be lost through conversion to other uses. Landscape Scale: Because so much of the Willamette Valley ecoregion is privately-owned, voluntary cooperative approaches are the key to long-term conservation using tools such as financial incentives, Candidate Conservation Agreements with Assurances, and conservation easements. Careful land use planning is also essential. Work with agency partners to support and implement existing land use regulations to preserve farmland, open spaces, recreation areas, and natural habitats. Monitor changes in land uses across the landscape and in land use plans and policies. Within Urban Areas: Parks and natural areas, wildlife corridors, and green infrastructure can contribute to conservation, connect people to the natural environment, and enhance the quality of life in communities. Maintenance of open-structured Strategy Habitats, such as grasslands, oak savannas, and wet prairies, is dependent, in part, on periodic burning. Fire exclusion has allowed succession to more forested habitats. Reintroduction of fire poses significant management problems in many areas of the valley. These problems include conflicts with surrounding land use, smoke management, air quality, and safety. Use multiple tools, including mowing and controlled grazing, to maintain open-structured habitats. Ensure that tools are site-appropriate and implemented to minimize impacts to native species. Reintroduce fire at locations where conflicts, such as smoke and safety concerns, can be minimized. Work with communities to ensure that air quality and other local concerns are addressed. The floodplain dynamics of the Willamette River have been significantly altered. Multiple braided channels dispersed floodwaters, deposited fertile soil, moderated water flow and temperatures, and provided a variety of slow-water habitats, such as sloughs and oxbow lakes. The Willamette River has largely been confined to a single channel and disconnected from its floodplain. While restoration of multiple channels may be neither practical nor desirable, cooperative efforts are needed to restore floodplain function and critical off-channel habitats. Using green infrastructure and careful planning for development outside of floodplains can help maintain floodplain function. Broad-scale conservation strategies will need to focus on restoring and maintaining more natural ecosystem processes and functions within a landscape that is managed primarily for other values. This may include an emphasis on more “conservation-friendly” management techniques for existing land uses and restoration of some key ecosystem components, such as river-floodplain connections and wetland and riparian habitats. “Fine-filter” conservation strategies that focus on needs of individual Strategy Species and key sites are particularly critical in this ecoregion. Invasive plants and animals disrupt native plant and animal communities and impact populations of at-risk native species. Emphasize prevention, risk assessment, early detection, and quick control to prevent new invasive species from becoming fully established. Use multiple site-appropriate tools (e.g., mechanical, chemical, biological) to control the most damaging non-native species. Prioritize efforts that focus on key invasive species in high priority areas, particularly where Strategy Habitats and Strategy Species occur. Work with the Oregon Invasive Species Council and other partners to educate people about invasive species issues and to prevent introductions of potentially high-impact species, such as the zebra mussel. Provide technical and financial assistance to landowners interested in controlling invasive species on their properties. Promote the use of native species for restoration and revegetation. Urban landscapes can present a variety of hazards for wildlife, such as bird collisions with windows, impacts due to light pollution, predation and disturbance by pets, collisions with vehicles and power lines, exposure to pesticides and contaminants, and harassment and illegal take of wildlife. These hazards can significantly impact wildlife and undermine habitat conservation efforts. Support and promote innovative campaigns and programs to reduce wildlife hazards. Work with municipalizes to develop policies, such as wildlife-friendly building guidelines, wildlife-friendly lighting strategies, and integration of wildlife crossings into transportation plans to reduce hazards. Support research into better understanding of urban wildlife hazards and the management strategies to reduce those hazards. Communities can establish “Adopt a Park” programs where residents volunteer to weed a park instead of applying pesticides. Communities, local governments, and non-profit organizations can promote bird-friendly building design and outreach efforts about the impacts of cats on wildlife. Wetland Prairie Restoration: An Online Resource is a comprehensive introduction to the history and ecology of wetland prairies in the Willamette Valley and overview of the restoration process. The online resource is based on the Practical Guidelines for Wetland Prairie Restoration in the Willamette Valley, Oregon, which distills 10 years of research and lessons learned in the Willamette Valley region. The restoration guide was developed by the City of Eugene, Lane Council of Governments, and the Institute for Applied Ecology to share how-to recommendations with wetland restoration practitioners and promote effective wetland conservation. More will be added to the site soon. The webpage, which is hosted on the Cascadia Prairie Oak Partnership website, was created by students in the University of Oregon’s Environmental Leadership Program, Kathryn Alexander, Kathy Fioretti, and Jeff Kresse, with Environmental Leadership Program Co-Director Peg Boulay. The U.S. Environmental Protection Agency generously provided funding to support the project through a Wetland Program Development Grant. The newly launched site illustrates the ecology, effective management practices, techniques, and timelines for restoration, as well as results from 14 different restored sites and several field studies. This resource will be of particular interest to wetland prairie managers and restoration practitioners.